Yesterday Skype celebrated its 10th anniversary. Launched August 29, 2003, within a month it had over 500,000 downloads. in some sense it was the confluence of broadband internet infrastructure and the founders’ experience with peer-to-peer architectures that allowed them to be so successful with the launch. Today it brings us chat, voice and video conversations enhanced with desktop sharing, file sharing, multi-party conversations, voice messaging, conversation and call archiving across a multitude of both desktop, mobile and broadcast platforms. My first exposure to IP-based communications was a VoIP client developed by my employer of the day back in 1995-96. But all it did was make the voice connection – over 43 kbps dialup modems using 100 MHz processor PC’s. You never even knew whom you might be talking to; there was no “directory”. Voice quality was choppy. It took another seven or eight years for many other pieces to come together. Initial adoption was largely in Europe. Why? Due to the monopolies of the European telephone companies that were often government run operations. Personally I had experienced this when living in Germany in 1972-73 at a time when it took 18 months for the German Post Office to install a line; we only lived there for 16 months. And monthly bills were not exactly low; in fact, they could be up to ten times the average North American residential telephone bill. The initial version of Skype not only made free voice connections; it included Instant Messaging (presence and chat) along with file sharing. Two years later you could start making calls to the PSTN using SkypeOut and take calls through a Skype Online Number. And then there has been Skype’s pioneering evolution of (free) video calling – the realization, across a large user base, on the AT&T picture phone dream at the 1964 New York World’s Fair. Today, with sufficient upload speed Skype video calling supports up to 1080p resolution at up to 30 frames-per-second (fps). Talking about bills brings up one more fact about Skype – you’ll never get a bill. Any paid services, such as for access to the landlines and mobile phones via wireless carriers, are prepaid, eliminating all the billing and collections infrastructure of the legacy telcos. yet it needs no translation as Skype is a universal word about connecting family, friends and business colleagues around the world. In 10 Years Of Skype – Massive Disruption… But Will Skype Remain Relevant? Dan York talks about Skype’s massive disruption, yet he also wonders what the next ten years will bring and whether Skype will remain relevant in today’s evolving IP-based communications world. Last year on the 9th anniversary I was asking the “what comes next?” question and Jim Courtney was similarly saying “whither Skype?”Phil Wolff was asking “is Skype boring?”, a theme I picked up on for my own post. Fast-forward a year and the questions are still relevant. Skype is no longer the “bright shiny object” that so many of us were so incredibly passionate about. Indeed, for so many years Skype was the single biggest topic I wrote about here on Disruptive Telephony. There was a reason that my phone number became associated with Skype and I was getting all sorts of calls for Skype‘s corporate office. And yet… how many posts did I write here on this blog about Skype in the last year since the 9th anniversary? Monthly or bi-monthly upgrades – where the only significant new feature has been Video Messaging. Yet the upgrades on all platforms have improved the quality and robustness of both the audio and video. That’s infrastructure that’s both transparent and boring to the user yet makes Skype more robust and reliable, enhancing the user experience. The most recent Skype for iOS brought 720p HD Video to the iPhone 5 and iPad 4 with Retina displays along with “Audio and video call quality and stability improvements”. Skype has introduced and later enhanced Skype for Windows 8 but personally I find it a very difficult interface to use; I continue to rely on Skype for Windows Desktop as an easier, more feature rich and more intuitive user interface. 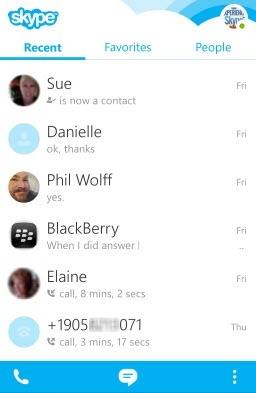 Skype 4.x for Android introduced a new user interface and overall Skype algorithm, shown on the right, that has been widely acclaimed. And we have Skype for BlackBerry 10 (Preview) which has allowed me to finally, and easily, follow all my Skype activity when I am away from my office. The forthcoming BlackBerry OS 10.2 offers the opportunity for a significantly enhanced Skype for BlackBerry 10 by year end. 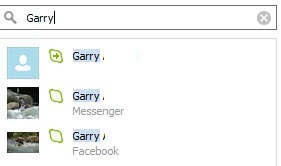 the sometimes controversial migration of Windows Live Messenger accounts to Skype, eliminating a Microsoft IM redundancy; I had not used my Messenger account for several years once I could reach my ten active MS Messenger contacts on Skype. But, for others for whom MSN Messenger was their primary messaging platform, it meant a significant change in their messaging user interface. And the entertainment world awaits the new Xbox 360 with Skype integration later this fall. While there’s been a lot of activity it’s been more about integration and enhanced performance rather than innovation over the past year. In earlier days bloggers thrived on talking about new Skype experiences. Today Skype has almost become a communications utility – but taking conversations way beyond legacy voice conversations. And therein lies a challenge. Not only seen with Skype but also with new mobile offerings. There are so many new features that getting the consumer and average business user to learn and deploy them has become a barrier to increased adoption and a challenge to develop awareness. It’s a constant education exercise to realize that conversations, especially in business, can be made more productive using feature-rich IP-based communications tools. Yet, beyond the obvious cost savings, there are many opportunities for new, enriched business and personal conversation experiences while enhancing communications productivity. Bottom line: while there have been many alternative offerings for IP-based conversations, Skype remains the sole conversation provider that offers a complete combination of chat, voice and video conversations, working across a multitude of platform end points (Windows/Mac/Linux PC’s, smartphones, tablets and TV’s), offering conversation enrichment through its additional features such as file sharing, voice and video messaging, desktop sharing, multi-party voice conference calls, conversation archiving and search – all free. Premium subscription services such as access to landlines and mobile phones via carriers and group video calling round out the offering of a complete conversation ecosystem. As for both audio and video call quality, Skype has been a leader and pioneer with its SILK codec (and hopefully soon support of Opus) and its HD video capabilities. Yet, Skype has had its ups-and-downs as it migrated through different ownership scenarios. There are competitors for some of the offerings, most notably, Google Hangouts for group video. The arrival of WebRTC empowers web developers with new ways to incorporate communications into web browsers. The half-life of hardware supporting Skype appears to be about two to three years. Some services have been withdrawn; support for third party applications has been, to say the least, a rough ride about to get rougher. But these make for the topic of another post. Today it’s about what one can do with Skype in its present state. As for the next ten years? 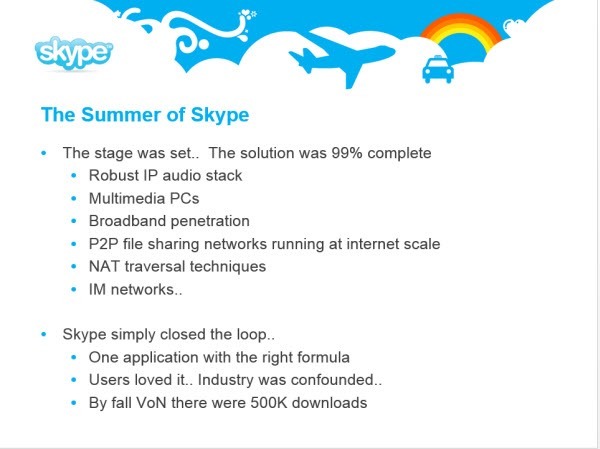 Check out Phil Wolff’s slide show, Ten More Years of Skype: Happy 10th Anniversary, Skype.